Want to travel to Southern California’s most chilled out city this summer, but are aghast upon hearing about the prices there? Despite what you might believe, it is possible to do San Diego on a budget. Here’s how to pull it off…! San Diego may be purdy, but that attribute doesn’t come cheap, as prices throughout Southern California suggest. Fortunately, Hosteling International has long provided hostel accommodation that is clean, quiet and conveniently located to attractions in the cities in which their affiliated hostels are found. Point Loma offers amenities like a fire pit, BBQ, table tennis court, as well as hosting events like weekly dinners and movie nights. This, plus comfy beds in the rooms will cost you less than $30 a night. Sure, you could get a room in a Motel 6 for not much more, but where’s the fun in that? Having occupied a place in the San Diego food scene for generations, El Indio Mexican Restaurant is a great place to get a taste of this city’s cuisine without forking out too much dinero. It is rumored that this kitchen was the birthplace of the taquito, and with outstanding options like mouthwatering fish tacos and burritos the size of your forearm, we’re willing to bet you’ll be back here multiple times during your stay in San Diego. Aren’t pro sports a no go when it comes to lists of budget things to do in a city? Not when it comes to baseball, as cheap seats in the outfield often go for peanuts – in the case of the San Diego Padres, the most inexpensive seats in the grassy lawn seating cost only $7, saving your money for more important things like foot long hot dogs and obnoxiously large foam fingers! After all that ballpark food, you’ll probably want to try and walk it off. Torrey Pines State Park is one of the more beautiful places in the city to undertake this easy form of exercise, as views of ocean, cliffs, and scrubby bush and pine trees will connect you to the natural landscape that used to exist everywhere a mere century ago. No matter your budget, it doesn’t cost a dime to slip on your board shorts / 2 piece bikini and head down to one of metro San Diego’s stunning beaches. 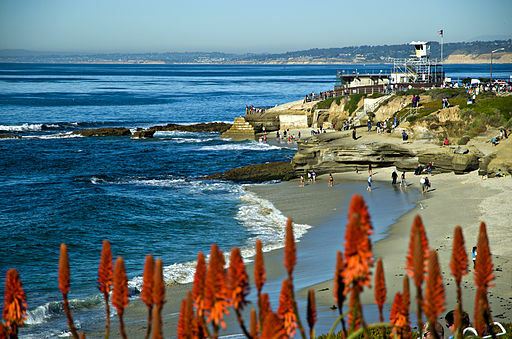 Whether you are looking to ride the waves (Encinitas), engage in the local social scene (Mission, La Jolla), or commune with nature (Solana, Point Loma), there’s a seaside nirvana awaiting your imminent arrival.